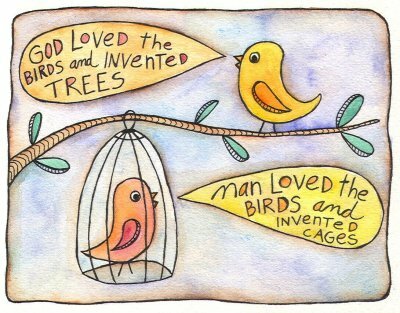 This little doodle is my submission for the Illustration Friday prompt of CAGED. I illustrated a quote by Jacques Deval that says a lot about two very different kinds of love. Great image and interesting quote. hehehe clever and very well done! so true and so sweet. Excellent. What a great choice of quote, and as always, lovely illustration. Is a book of all your illustration in the works? Food for thought. Your work always inspires. Bittersweet...but nice drawing, darling birds.